University of Iowa Sophomore Jordan Bohannon walked to the free-throw line and nervously looked into the stands to make eye contact with his older brother, Zach. 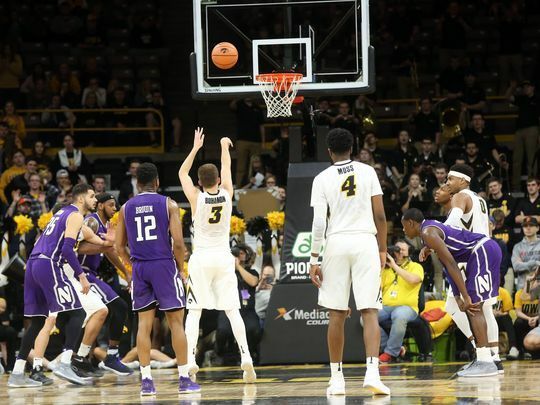 Bohannon was on the verge of breaking a record of 34 consecutive free throws that had stood for 25 years by a legendary Hawkeye, Chris Street. Everyone knew it would happen. Jordan had once hit 200 consecutive free throws in practice. So, with 2:15 to go in the game. And Iowa leading Northwestern 73-65, Jordan eyed the rim. Took his customary 4 dribbles. Bent his knees. And let it fly. Yes, he intentionally short-armed it and the ball bounced off the front of the rim. You see Chris Street was tragically killed in an automobile accident, January 19, 1993. Three days earlier he had made two free throws to make it 34 in a row. But never got a chance at number 35. So, Jordan, who had thought about doing this for quite a while, choose to honor Street’s legacy by allowing his record to stand. “It was a touching tribute from one Iowa born Hawkeye to another,” wrote Chad Leistikow in the Des Moines Register. Mike Street had told people who asked leading up to this that he wanted Bohannon, a hard-working player like his son was, to break Chris’ mark. But he understood and treasured the tribute. It’s one thing to read those words in a Bible class or in the privacy of your home, it’s quite another to actually live them. To do something in a concrete way that elevates another person. Honors them. And puts their interests ahead of your own. Think of the many opportunities we have to humbly “esteem others better than ourselves” in our families? In our churches? In our communities? In our jobs? In our daily interactions with other people? Life is bigger than basketball. Or our homes. Our hobbies. Our professions. Our success. And our own little world of personal achievement. “Whoever desires to be great among you, let him be your servant” (Mk 10:43).